National Car Company (NCC), founded by H.E.LATE SHEIKH NASSER BIN ABDULLAH ALTHANI, is one of the oldest automotive companies in Qatar. Established in 1966, with a modest beginning as a mechanical workshop, NCC has grown into a multi-franchise automotive company with state of the art showrooms & aftersales facilities dedicated to the world’s leading brands in passenger & commercial vehicles under its fold. National Car Company established business association with Hyundai Motor Company in 1978 with the import of the world famous Hyundai model, ‘Pony’.Over the years, it has established itself as the sole distributor for Hyundai passenger & vehicles as well as a leading automotive company in Qatar.In an enduring partnership with Hyundai Motor Corporation over the past36 years, NCC has contributed towards the immense growth and enhanced brand loyalty of Hyundai in Qatar. A strong sales and after-sales network spread across the country, as well as a consistent customer-centric approach, have helped NCC raise Hyundai to an enviable position inQatar’s automobile market. 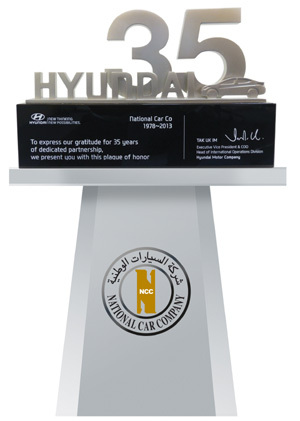 Delivering quick, efficient and quality customer care has alwaysbeen the hallmark of NCC, establishing Hyundai as one of the most loved and trusted brandsin Qatar across generations. NCC after-sales facilities, located in Doha and Industrial Area, are equipped with the latest technology and Hyundai-trained professional teams to ensure utmost customer satisfaction and provide every Hyundai vehicle the care it deserves. To deliver unparalleled After Sales Services, NCC operates a Quick Service Centre in Doha while the Main Service Center is located in Street No.16, Gate No.151, at the Industrial Area. It is one of the biggest service centers in the country and has state of the art facilities like body shop, maintenance, electrical, air conditioning & mechanical workshops. The technical & customer service staff go through rigorous training by our Principals to provide exceptional levels of service to our valued customers. We have also built a well-equipped Training Centre to upgrade our technical and non-technical staff with the latest technology and features on the existing and new models. Reinforcing further the aftersales network, National Car Company maintains one of the biggest Genuine Parts centers in the country which provides support for the internal Service Centre as well as to the outside customers. Currently more than 100,000 line items are available in inventory and NCC ensures high parts availability across all models for the benefit of customers.